This could be it! The last year of JOF!! Nearly 15 years ago we built our worship center and added our office and adult classroom buildings to make room for our friends alongside us at NW. We’ve been steadily sacrificing to pay the original $2.9 million price tag since that time. At present only $181,000 remains - by God’s grace an amount within our ability to pay off in the coming year! Once we are debt free we will be able to release those funds into direct ministry to others here in Wake Forest, as well as our church plants and around the world! I am excited about the opportunities that await the fuel of those soon to be freed-up resources! Each year we have been tithing our JOF gifts to whet our appetite for that day when we are debt free! We have given substantial gifts to our church plants, an orphanage in Ethiopia, earthquake relief in Pakistan, our local crisis pregnancy center, upfitting handicapped restrooms in building 2, a ministry in Kazakhstan that reaches out to drug addicts and prostitutes, training Haitian pastors, outreach to Mormons in Utah, ministry after the hurricane in Puerto Rico… and more! Once our debt is paid off, we can potentially multiply those gifts ten-fold! 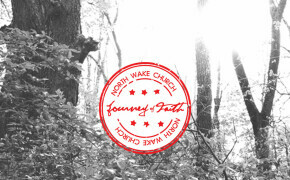 Each year, each one of us who calls North Wake home prayerfully seeks God concerning our part in paying off our facilities debt (our “journey of faith” - JOF). At the close of this letter are some important numbers pertaining to this need. None of these numbers are more important to me than the percentage of North Wakers who participate. Ours is a church without great wealth, so the participation of each of us matters greatly. This is a responsibility we all must share in if we are to meet this important goal of being debt free next year! In the weeks ahead, you will be getting additional information on our JOF capital campaign. We’ll be taking up our pledges for the coming year on November 11th. I do hope you will prayerfully consider what your part in this is as we trust God to continue to teach us to be gladly generous. When that day comes next year and we are debt free, it's exciting to think about how God is going to use us! The current balance owed is roughly $181,000. We have paid off over $2,700,000 of the debt and are headed into the home stretch! At the present rate, we will be debt free in 1 year! Our monthly payments are $12,970. The interest portion averages $700 each month! Last year 175 families and singles pledged $177,662 towards our facilities debt! There are approximately 267 households that call North Wake home.